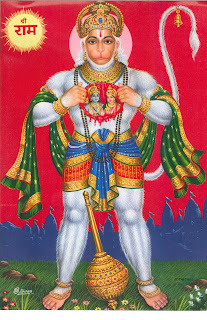 Lord Hanuman was born to wind god Vaayu and Queen Anjana, Hanuman has a human body with a monkey's head. He is one of the most popular gods amongst Hindus and is seen in temples throughout India. His picture, often with Lord Rama and Sita from Ramayana(epic) and can be found in almost every Hindu home. He is considered to be the god of power and strength and as such is the most favored deity or god of wrestlers and warriors. There are many interesting legends surrounding lord Hanuman. When quite young, he saw the rising sun and thought it to be a ripe fruit. He therefore jumped up high to it and put the sun in his mouth. This made Indra angry and he whips him with a thunderbolt. In response the wind god Vaayu refuses to breathe air into the world, reminding Indra to apologize and the other gods to bestow immortality and give back Hanumans Powers. Hanuman was the greatest, most faithful helper of Lord Rama in his campaign against Ravana. When sent as Rama's envoy or messenger, Hanuman was given a ring to convince Sita that he truly was her husband's(lord Rama) messenger. As he was the offspring of the god of winds, he concentrated his powers and crossed the seas killing a sea demon with a formidable leap and reaching Lanka where Sita was being held prisoner by Ravana the demon-king. He had succeeded in meeting the Sita queen in a garden called Ashoka-vatika, showed her Rama's ring and assured her that Lord Rama would be coming soon to rescue her from the demon-king's clutches. However, in the process Hanuman was caught and captured by Ravana's guards and brought before his court, but not before he succeeded in killing a large number of guards of Ravana, including Ravana's son, Akshaya. The demon-king commanded his servants to dip the Hanuman's tail in oil and set it on fire. Hanuman grew his tail to very large size and the servants rolled his tail with cotton and oil. Then his tail was then set on fire. Hanuman set the entire Lanka on fire before escaping and returned to Lord Rama's camp. Hanuman briefed Lord Rama about the situation in Lanka and with his younger brother Lakshman and with a big army of monkeys, and made preparations to invade Lanka. Upon reaching the sea shore, Rama first worshipped to Lord Shiva and prayed for the success of his mission. But, he did not know how his vast army would be able to cross the ocean to reach lanka. Then Lord Shiva told Rama to build a bridge with the help of one of his army personnel, an ape named Nal, who is the son of the god of construction. Rocks were brought and, under Hanuman's supervision, Nal threw the stones into the sea, where they miraculously floated. A long bridge was thus built connecting Sri Lanka along the shores of India, and Rama's army crossed the sea and reached the outskirts of Ravana's kingdom. Fierce fighting began and in the course of battle, Rama's brother Lakshman was severely wounded and fell unconscious. The arrow that had wounded Lakshmana was so powerfull that whoever will get wounded with it in the night could not recover , if the cure was not obtained before the daylight. The physician suggested a herb that could save Lakshman's life but it grew far away only in one of the mountain ranges of the Himalayas and someone had to fetch it before day break. Immediately agile Hanuman fled with his powers towards that mountain with the speed of the wind. when he reached the mountain he could not find the magical herb suggested by the physician in his hurried state, then he lifted the whole mountain and flew with it back to the battlefield. To thwart his efforts, powerful Ravana compelled the sun to arise on the mountain at midnight. Angry with the conspiracy, Hanuman leapt up, seized the sun under his arm and put the mountain on his head. Only after the curing of the desired herb upon Lakshman's wound did Hanuman permit the sun to depart. After a extreme battle of many days, Ravana was defeated and victory ensued. Hanuman accompanied Rama upon his victory return to Ayodhya and there was given by Rama the blessings of perpetual youth and deathless existence. Hanuman remained celibate for his entire life and is known as the greatest devotee of the god Rama, who loved him the best. His devotion was so great that once he tore open his chest with his claws to show that images of Rama and his wife were shown in his heart. Hanuman was not only a warrior of great strength, but he was also well versed in the scriptures and science. Hanuman is also well known as ninth author of grammar. Tuesday is considered as the sacred day of worship for Lord Hanuman. On every Saturday's devotees chanting Hanuman Slokas,will be free from the obstacles they face and be fearless with all the strength of lord Hanuman.